Various aspects of the influence of Coulomb resonances and quasireal photons on the dynamics of nuclear electro-disintegration by high-energy electrons have been studied in the framework of the nuclear shell model. Some peculiarities of numerical methods used to study the inelastic scattering cross-sections of high-energy electrons are also considered. A.G. Sitenko and V.N. Gur'yev, Zh. Eksp. Teor. Fiz. 39, 1208 (1960). K.W. McVoy and L. Van Hove, Phys. Rev. 125, 1034 (1962). R.S. Willey, Nucl. Phys. 40, 529, (1963). W. Czy’z, Phys. Rev. 131, 2141 (1963). V. Devanathan, Ann. Phys. 43, 74 (1967). V.K. Tartakovskii and A.A. Pasichnyi, Ukr. Fiz. Zh. 13, 1361 (1968). A.A. Pasichnyi and V.K. Tartakovskii, Ukr. Fiz. Zh. 13, 2013 (1968). A.G. Sitenko, A.A. Pasichnyi, and V.K. Tartakovskii, Yadern. Fiz. 12, 1208 (1970). A.A. Pasichnyi, Ukr. Fiz. Zh. 17, 1130 (1972). N.G. Afanas'ev, I.M.Arkatov, V.G. Vlasenko, V.A. Gol'dshtein, S.V. Dementii, E.L. Kuplennikov, V.I. Ogurtsov, and V.I. Startsev, Preprint KhFTI74-7 (Khar'kov Fiz. Tekhn. Univ., Khar'kov, 1974) (in Russian). R.R. Whitney et al., Phys. Rev. C 9, 2230 (1974). L.F. Mattheiss, J.H. Wood, and A.C. Switendick, in Methods in Computational Physics, Vol. 8, edited by B. Alder, S. Fernbach, and M. Rotenberg (Academic Press, New York, 1968), p. 63. J. Moygey et al., Nucl. Phys. A 262, 461 (1976). A.A. Pasichnyi, Ukr. Fiz. Zh. 22, 2039 (1977). V.V. Balashov, Quantum Theory of Collisions (Moscow Univ., Moscow, 1985) (in Russian). J.S. O'Connell et al., Phys. Rev. C 35, 1063 (1987). A.G. Sitenko, A.I. Akhiezer, and V.K. 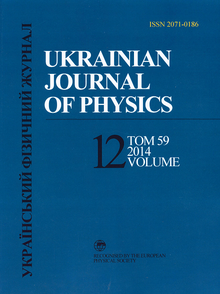 Tartakovskii, Nuclear Electrodynamics (Springer, Berlin, 1994). A.A. Pasichnyi, Yadern. Fiz. 54, 1543 (1991). A.A. Pasichnyi, Ukr. Fiz. Zh. 37, 487 (1992). M. Zhongyu and F. Dachun, Phys. Rev. C 45, 811 (1992). G. Garino et al., Phys. Rev. C 45, 780 (1992). V.R. Pandharipande and S.C. Pieper, Phys. Rev. C 45, 791 (1992). A.A. Pasichnyi, Ukr. Fiz. Zh. 38, 1619 (1993). D.B. Day et al., Phys. Rev. C 48, 1849 (1993). C.F. Williamson et al., Phys. Rev. C 56, 3152 (1997). D. Dutta et al., Phys. Rev. C 61, 061602 (2000). A. Meucci, C. Giusti, and F.D. Pacati, Phys. Rev. C 64, 014604 (2001). O. Benhar, D. Day, and I. Sick, Rev. Mod. Phys. 80, 189 (2008). A.A. Pasichnyi and O.A. Prygodiuk, Yadern. Fiz. 68, 2051 (2005). A.A. Pasichnyi, Elem. Chast. At. Yadr. 41, 197 (2010). A.A. Pasichnyi and O.A. Prygodiuk, Open J. Microphys.3, 12 (2013). K.N. Mukhin, Experimental Nuclear Physics, Vol. 1. Physics of Atomic Nucleus (Moscow, Mir, 1987). J.J. Sakurai, Advanced Quantum Mechanics (AddisonWesley, Reading, Massachusetts, 1967). V.B. Berestetskii, E.M. Lifshitz, and L.P. Pitaevskii, Relativistic Quantum Theory (Pergamon Press, Oxford, 1982). A.I. Baz, Ya.B. Zeldovich, and A.M. Perelomov, Scattering, Reactions and Decays in Non-Relativistic Quantum Mechanics (Israel Program for Sci. Transl., Jerusalem, 1969). D.A. Varshalovich, A.N. Moskalev, and V.K. Khersonskii, Quantum Theory of Angular Momentum (World Scientific, Singapore, 1988). S.E. Koonin, Computational Physics (Addison-Wesley, Reading, MA, 1986). H.F. Lutz and M.D. Karvelis, Nucl. Phys. 43, 31 (1963).